It is advice that has been touted by doctors for years -- breastfeeding for the first six months is good for both baby's health and mom's -- so why are so many new mothers opting for formula or other baby food before this benchmark? A study by California researchers, "Juggling Work and Life During Pregnancy," seems to have found some answers to this question. According to the study, which was funded by the U.S. Maternal and Child Health Bureau and published last year in Pediatrics, the worst culprit behind this early abandonment of breastfeeding is a return to the workforce. The researchers discovered that while a growing number of women begin breastfeeding when their child is born (up from 71% in 2000 to 74% in 2006), the percentage of mothers still nursing shows a decrease (to 43%) by the time baby is six months old, and decreases significantly again by twelve months (to 23%). To determine the cause of this decline, they examined data from 770 California mothers, all full-time workers. What they discovered was that the length of a woman's maternity leave seems to have a direct correlation with how long she breastfeeds. According to a story in HealthDay, Sylvia Guendelman, chairwoman of the maternal and child health program at the University of California, Berkeley, School of Public Health, "What we saw is if women take very short maternity leaves, of six weeks or less, they run more than a three times higher risk of quitting breast-feeding compared to those still at home who haven't returned to work." There are several factors that may make nursing harder for working moms, the most prominent of which is the opportunity to express milk in the workplace. 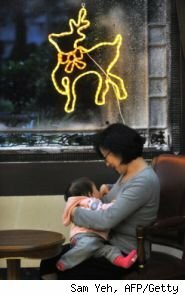 Women with their own office, or women from states with laws allowing time to pump during the workday (Oregon, for example, which has the second-highest success rate in the nation for long-term breastfeeding), tend to have an easier time providing human milk for their infant after they return to work. I urge all new mothers out there to do their best to follow the American Academy of Pediatrics guidelines on this issue. The AAP recommends breastfeeding for the first year of a child's life, and breastfeeding exclusively for the first six months before adding in cereals, baby foods, juices, etc. This allows your baby to fully reap the benefits of breast milk, including increased protection from ear and respiratory infections, stomach viruses and other digestive upsets, and even long-term benefits like a decrease in the risk of asthma and obesity as they age. Nursing also provides benefits for the new mom, decreasing her likelihood of some types of cancer, type 2 diabetes, and postpartum depression. Breastfeeding exclusively for the first six months can also save hundreds of dollars otherwise spent on formula (remember, breast milk can be kept safely for up to four days in the refrigerator), and with all the health benefits provided, you can count on health care savings from reduced doctor visits as well. Dr. Kronhaus hosts Good Day Health, a nationally syndicated weekend radio show heard on more than 150 stations across the country, and is featured Monday - Friday in the "Daily Dose" segment on Doug Stephan's Good Day, heard on more than 300 stations in morning drive. You can sign up for his free e-newsletter here.